So I didn't expect to be writing this post any time soon. 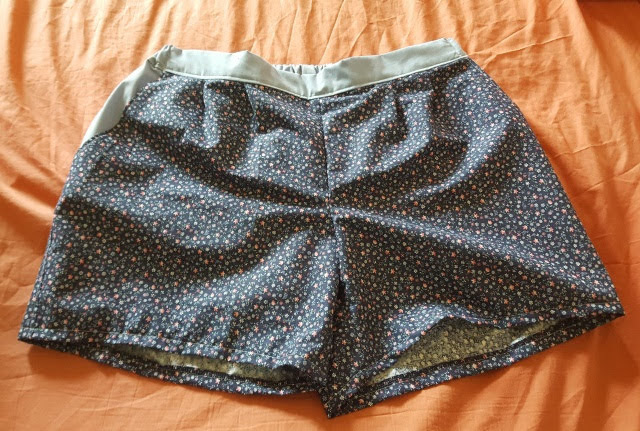 Actually I'm a bit shocked... because in one day I managed to start and finish a pair of shorts! I did trace and cut out the pattern a couple of days before but didn't start cutting fabric until Sunday morning. 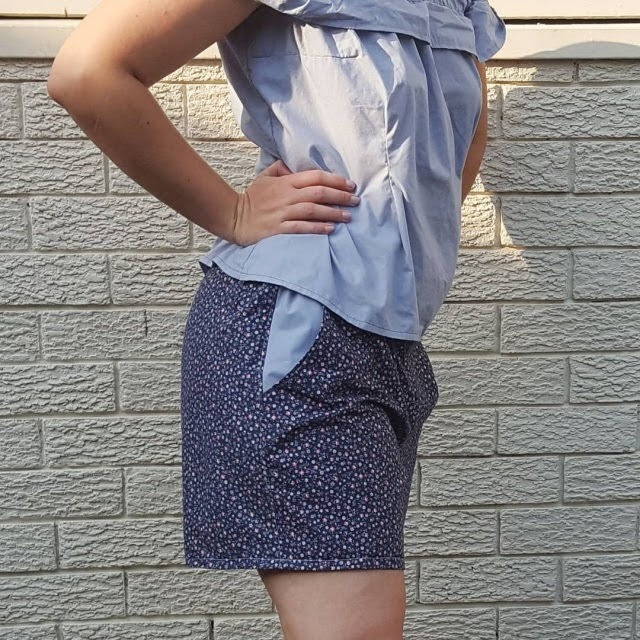 This is the Belize Shorts pattern by Itch to Stitch and I am already in LOVE with it! 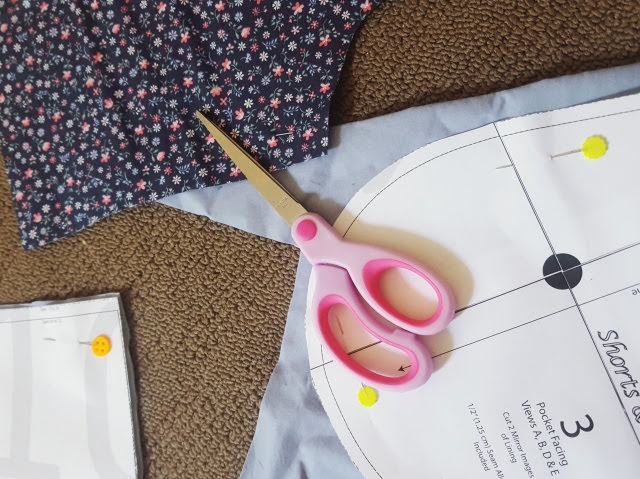 From this time I started sewing it to the time I finished the instructions were clear and the pattern just came together quickly and easily. 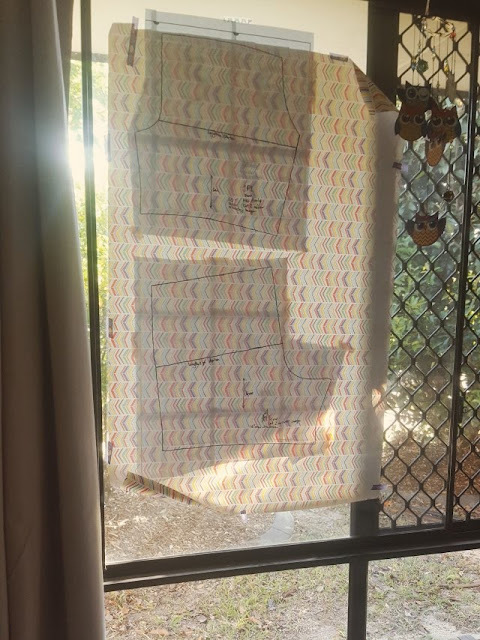 I have taken to using wrapping paper to trace out my patterns on as it is so much wider than anything else and I don't need to piece it together. 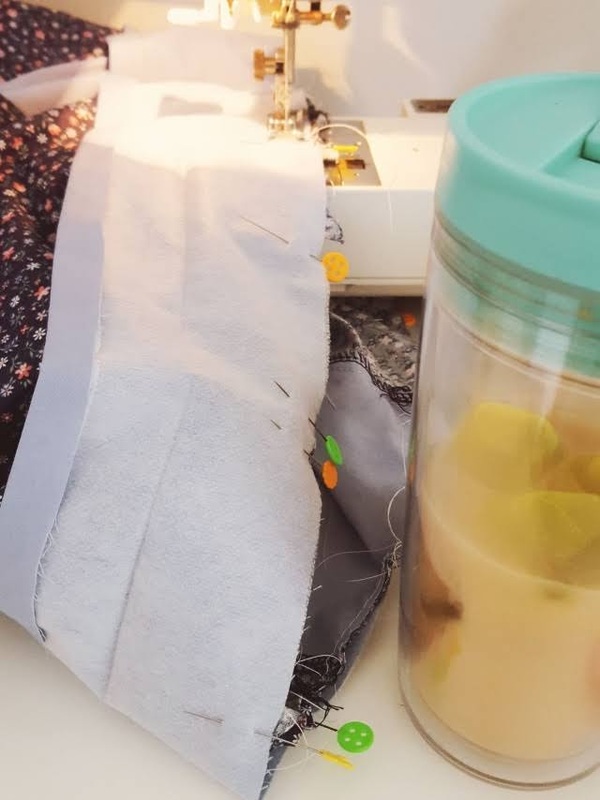 I had this quilting cotton (at least that is what I think it is) that was part of some fabric my grandma had given me so I decided to use it to test out the pattern and make a wearable muslin. 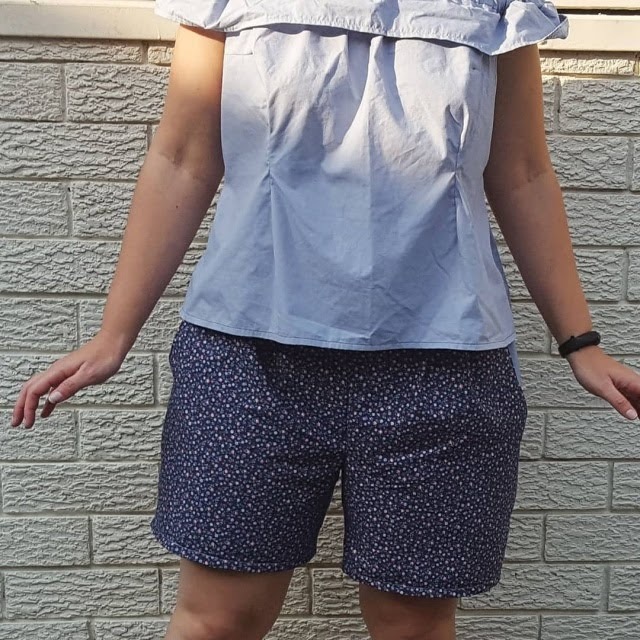 I didn't have enough of the floral fabric to make the waistband and pockets so I used my trusty blue sheet.... I don't have much of this sheet left now it has been pretty amazing! Here I am sewing on the waistband of the pants. It really didn't take long to get to sewing on the waistband. I got given a T2 cup for my birthday and it's designed to make iced tea as well as hot teas and I'm in love with it and it was needed on the weekend as it was uncomfortably hot. And here is my finish : D One pair of pants all ready to be worn! I love the way they have turned out. I also need to work out how to get rid of that little bit of excess fabric in the front. If anyone knows how please help me! But I will wear and wear and wear these this summer as they are long enough that I'm not feeling exposed while still being comfortably cool. 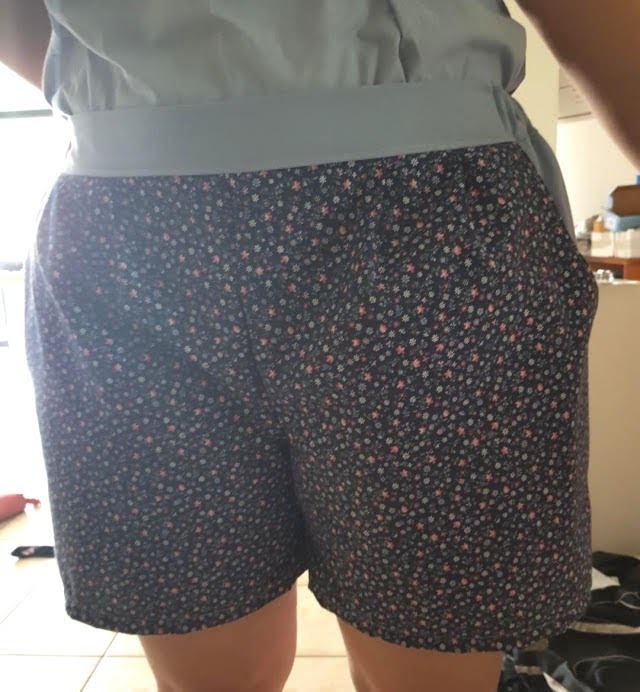 But for my first ever pair of shorts for myself I am really happy with how these turned out. I also paired them with my modified sorbet top as this was another one made out of the tester sheet fabric. p.s. I do get all your comments and I reply to them on the comment itself... the comments stopped coming to my email so I can't reply there anymore. nope not just you ... for some reason some stopped appearing in my inbox about 6 months- a year ago and then in the last couple of months none of them do. Unfortunately there really isn't a better comment system for blogger than the one that comes with it as I have found out. Each has their problems. and thank you.